The German Advisory Council on Global Change (WBGU) is a scientific advisory body set up by the German government to provide policy advice. Nebojsa Nakicenovic, IIASA deputy director and researcher in the Transitions to New Technologies Program (TNT), has been one of the nine appointed members since the inception of the WBGU, and completed his second term in 2016. In 2016, the WBGU published two new reports, both of which were written with substantial TNT input: Humanity on the move: Unlocking the transformative power of cities on urbanization, and Development and justice through transformation: The Four Big ‘I’s, addressing the 2030 agenda and the Paris Agreement. The latter report stresses the role of the G20, a group of twenty major, industrialized, and emerging economies, in advancing the implementation of both agreements, seizing the opportunity of this “great transformation” to sustainability as a unique ­modernization project that could offer substantial opportunities for economic development. Several researchers from the Transitions to New Technologies Program made significant contributions to the report, including assisting in the analysis of a new transformative energy and climate scenario. The collaboration between TNT and the WBGU, which concluded in 2016 after six years, exemplifies the policy impact and dissemination strategy followed by IIASA. By collaborating closely with “bridging institutions” such as the WBGU or the Intergovernmental Panel on Climate Change, TNT enjoys a unique access to high-level policymakers for presenting new research results. For instance, the WBGU has had around 10 meetings at the ministerial level, including face-to-face meetings with the German Chancellor Angela Merkel. Kraas F, Leggewie C, Lemke P, Matthies E, Messner D, Nakicenovic N, Schellnhuber HJ, Schlacke S, et al. (2016). Development and justice through transformation: The Four Big ‘I’s. Special Report. Berlin: WBGU – German Advisory Council on Global Change. Kraas F, Leggewie C, Lemke P, Matthies E, Messner D, Nakicenovic N, Schellnhuber HJ, Schlacke S, et al. (2016). Der Umzug der Menschheit: Die transformative Kraft der Städte. Berlin: WBGU – German Advisory Council on Global Change. Kraas F, Leggewie C, Lemke P, Matthies E, Messner D, Nakicenovic N, Schellnhuber HJ, Schlacke S, et al. (2016). 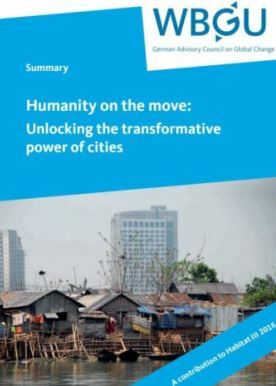 Humanity on the move: Unlocking the transformative power of cities. Berlin: WBGU – German Advisory Council on Global Change.